The unofficial summer swansong is upon us but that isn’t stopping American travelers from continuing their wanderlust. The team at Viator, a TripAdvisor company and the leading resource for tours and activities worldwide, has ranked the top 10* international and domestic activities American travelers are enjoying over the 2016 Labor Day Weekend. According to Viator bookings made by U.S.-based travelers for the season’s closing 3-day weekend, Europe-based activities occupy six of the top 10 most popular tours worldwide. So, there’s no doubt Viator's U.S.-based customers are traveling abroad and truly making the most of their late-summer holidays. While many travelers are headed overseas, lots are staying close to home, taking in some of the country’s most iconic attractions made by man and Mother Nature including the Grand Canyon, Muir Woods and Niagara Falls. Americans are flocking to the land of “la dolce vita” as travel experiences in cities across Italy make up half of the top 10 most popular Labor Day tours outside the U.S.: the Vatican, St Peter's Basilica, the Colosseum, the Tuscan countryside and Rome’s city-center are captivating travelers. Two destinations with solid value now due to favorable currency exchange rates feature two of the top 10 activities; Reykjavik’s Blue Lagoon Spa, and London’s exploration of Stonehenge, Windsor Castle and Bath. Barcelona boasts two of the top 10 international favorites for the weekend: Skipping the line at Barcelona’s Sagrada Familia and the City Sightseeing Hop-on Hop-off Tour; with the Eiffel Tower in Paris rounding out the international top 10. The list of the 10 most popular tours across the U.S. booked by American travelers for Labor Day weekend is as unique as the country itself, which also highlights the diverse nature of Viator’s offerings for travelers. 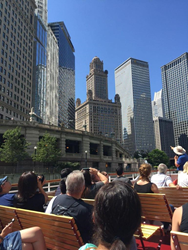 The number one tour booked for Labor Day weekend in the U.S. is the Chicago Architecture River Cruise, showcasing the Windy City’s unique architectural landscape encompassing numerous inspiring styles constructed by renowned architects. From manmade to nature’s work, three Grand Canyon experiences from Las Vegas are trending for the upcoming weekend, with other American beauties including Muir Woods, the Giant Redwoods and Niagara Falls, along with the inviting crops of Northern California – aka Napa and Sonoma Wine Country – proving popular among domestic travelers also. Experiences in New York serve as homage to the city and the country with the 9/11 Museum, the Statue of Liberty and Ellis Island, and One World Observatory activities ranked firmly among the most booked. For information on these experiences and thousands more – all bookable online and on-the-go on the free Viator Tours & Activities App – as well as the latest deals, promotions, contests and news, visit Viator.com, or follow Viator on Facebook (ViatorTours) and Twitter (ViatorTravel). *NOTE: Rankings are derived from bookings made by U.S.-based Viator customers (as of Aug. 29) for the period September 3 - 5, 2016.